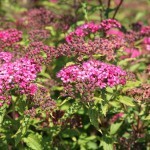 A dense rounded shrub with flat-headed, bright pink, 4-6" wide flower clusters. New foliage emerges with reddish purple tinting in spring, matures to blue-green then turns reddish in fall. 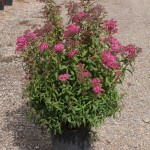 It is easily grown in full sun in a medium moisture, well-drained soil. Prune in late winter to early spring if needed. Useful in the shrub border, as a low hedge, or foundation planting.